Last year’s Christmas trifle was a bit disappointing. The sponge wasn’t quite right, it wasn’t moist enough, and no one really liked it that much. I decided that I wasn’t going to bother again. But then I had an idea – Ginger Kiss Trifle! I’d already made ginger kisses once and liked them, and I thought they’d make a deliciously flavoursome base for the trifle. This is less of a recipe and more a set of instructions that relies on other recipes. Therefore you won’t find a complete list of ingredients at the start, and it’s all a bit approximate. Oh, and it’s all vegan of course. It’s hard to take a good picture of trifle and this doesn’t even come close! Step 2 – Stew a couple of cups of fruit (rhubarb and apple was nice, but next time I’m going to try pear). Step 3 – Make sure you have a can of coconut cream cooling in the fridge. Step 4 – Make this caramel sauce from Jessica in the Kitchen and put it in the fridge to thicken. Step 1 – Make the icing from the ginger kiss recipe – make sure it’s not too thick. Step 2 – Put the first third of the ginger kiss biscuits down. Sprinkle with two tablespoons of brandy. Step 3 – Spread the first half of the stewed fruit. Step 4 – Pour/spoon on half of the caramel sauce. Step 5 – Another layer of ginger biscuits with two more tablespoons of brandy. Step 6 – Spread/spoon over the icing. Step 7 – Another layer of stewed fruit. Step 8 – The second half of the caramel sauce. Step 9 – Last layer of biscuits. 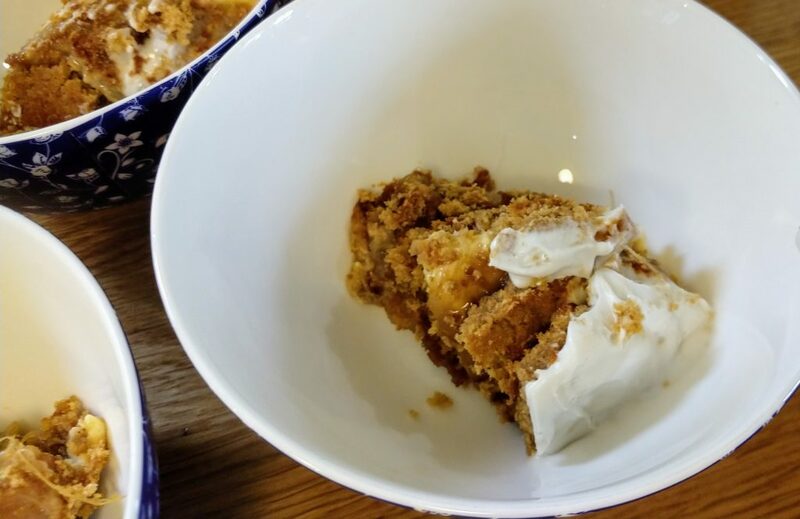 Step 10 – Top with the whipped coconut cream (add a couple of tablespoons of icing sugar, a teaspoon of vanilla essence, and one or two tablespoons of brandy). Step 11 – Put in the fridge for a couple of hours. Step 12 – Just before serving, garnish with chopped crystallised ginger, or chocolate flakes, cherries, or whatever you fancy. 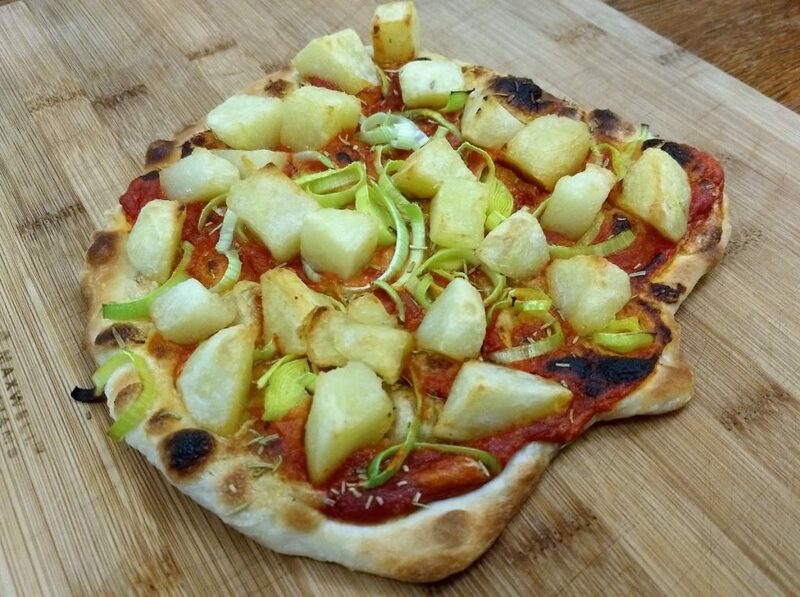 My latest challenge has to been to develop a good vegan pizza – without the use of vegan cheese. Obviously it wasn’t going to be cheesy but I wanted it to have a combination of flavours and textures that satisfied my pizza appetite. 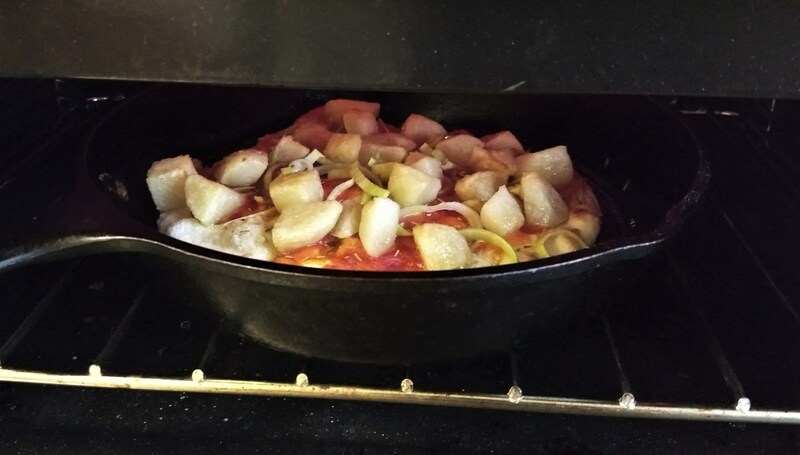 At the same time, I also want to document the cast-iron skillet + grill (US: broiler) technique I use to cook pizza these days. Makes 3 medium pizzas, serves 3-4. You will need a cast-iron skillet and a grill (US: broiler). The texture should be spreadable, add more extra virgin olive oil if required. Mix yeast into warm water and leave 10 minutes to develop. It should froth up a bit. If it doesnt, either the water is too hot or the yeast is dead, try again. Make a well, pour in yeast mixture and olive oil. Turn out onto a floured surface and knead until it’s all the same consistency and springs back when pressed. Apply a fine coat of olive oil, put back in the bowl and cover. Leave in a warm place until it has risen to at least twice the original size. 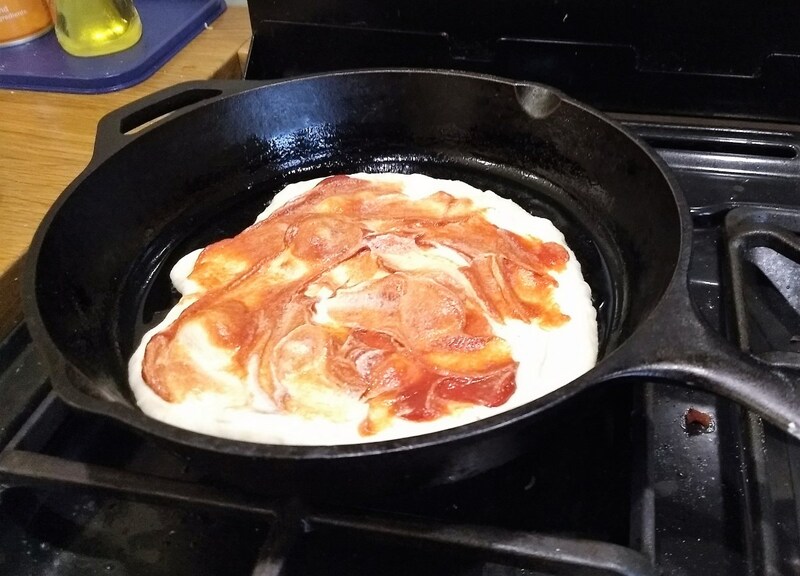 Take a third of the dough and roll out to the size of your skillet. Heat the skillet to medium-hot and the grill to medium. Put 1 tbsp of extra-light olive oil into the skillet. 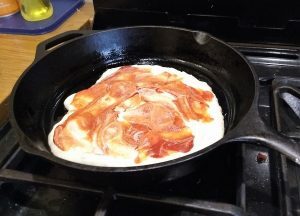 Put the rolled out dough into the skillet. Coat with about 2 tablespoons of the cashew cream and 1-2 tablespoons tomato paste (to taste). Sprinkle leeks, roast potatoes, rosemary and salt. Drizzle extra virgin olive oil over the top. Put the skillet under the grill. Leave under the grill until it looks cooked (some slight blackening is expected). Return the skillet to the burner and cook until the base is done (it should be nicely browned). This recipe is a minor variation on this one. Muffin tin and, ideally, paper muffin cases. In a bowl put the flour, sugar, baking powder, baking soda, salt, orange zest and chocolate chips. Mix it all until well combined. In another recipient put the orange juice together with the olive oil. Mix the oil and juice with the dry ingredients only as much as necessary to mix and pour/spoon into the cases. Bake for about 20 minutes or until colored. Inspired by this recipe for Vegetables Manchurian, I made a type of cabbage hash that worked very well in a burger. Mix all ingredients (except for oil) in a bowl. Heat the oven to 210C (190C fan) / 410F. To make the crosses, mix 3 tbsp plain (all purpose) flour with 2 tbsp water to form a thick paste. Spoon into an icing bag with a thin nozzle (or a plastic freezer bag and snip the corner). Slowly pipe along each row of buns, then repeat in the other direction. Place in the oven and bake for 20 minutes on the middle shelf, until golden brown. This is a really simple vegetarian chilli that we make quite a bit. It is tasty with nachos, on rice, with baked potatoes, etc, etc. It also freezes really well so we always have a few bags in the freezer ready for “Oh dear, what shall I cook?” dinners. Think of this as a base and, if you follow these rough proportions, you can make all sorts of changes. Switch out one or more cans of kidney beans for black beans, add mushrooms or capsicum alongside the onions, do your own spicing, etc, etc. I often double or triple this in a large stockpot. Chop the onions and fry at medium heat until somewhat cooked/translucent. Drain the kidney beans and add. Add the tomatoes (don’t drain them). Bring to a simmer and keep it that way for 30 minutes. Add the frozen veges and simmer for another 5-10 minutes. From Healthy Food Guide March 2013. Preheat oven to 190c. Arrange eggplant slices on a baking tray lined with baking paper. Spray/paint with olive oil. Bake for 10 minutes. Meanwhile, heat 1 tbsp olive oil in a large non-stick pan and cook onion and garlic until softened. Add tomatoes, pesto, sugar and chilli. Simmer for about 4 minutes until sauce has reduced. Add most of the basil. Season to taste. Place half of eggplant slices in lightly greased baking dish. Spoon over half of the sauce. Repeat layers. Bake for 15 minutes and serve garnished with remainder of the fresh basil. Kim Edit: I quite like adding roasted asparagus, roasted mushroom, 2 tablespoons of cut up sundried tomato and 2 tablespoons of marinated artichoke. Yum. This is a straight cut’n’paste of the delicious tabouli recipe from here (well, with half as much pepper). I make it quite a lot and got tired of searching for it each time. Soak the cracked wheat in the hot water until the water is absorbed, about 30 minutes. When it’s ready, drain any excess water, if necessary, and squeeze dry. Meantime, prepare the vegetables for the salad and mix the dressing ingredients together. Set aside. Stir the prepared bulghur, other salad ingredients, and dressing together in a medium bowl. Serve chilled or at room temperature. Makes about 8 cups, 12 to 16 servings.